I took half a personal day to go to the University of Texas and attend a brown bag lunch session with Dr. Milner (one of our grad school professors this summer). He was formerly at Vanderbilt University but now has an even larger role at the University of Pittsburgh. His book "Start Where You Are, But Don't Stay There" is a fantastic read for those interested in bringing cultural competence into schools and the classrooms. 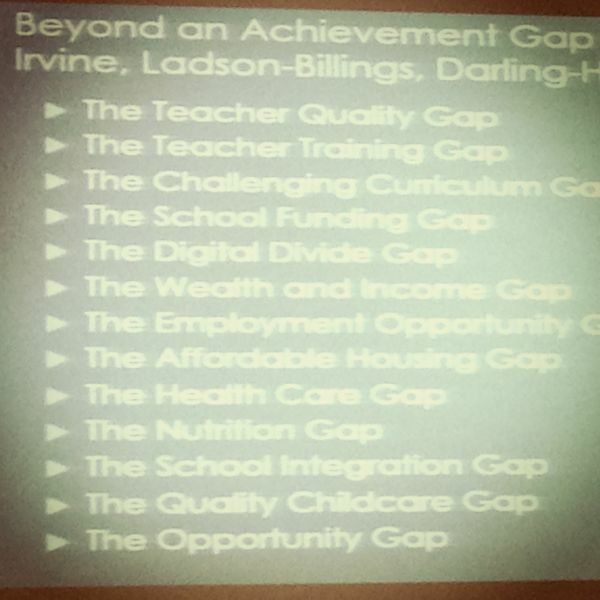 Here is a slide from his presentation where he talks about the ridiculous nature of the popular "Achievement Gap" and how a difference in test scores is not due to some substance of "achievement" but rather is a product of multiple other gaps.